Let’s be honest, our pets are family. Wherever we go, they go. This is especially true for my pup. And just like me, I imagine she enjoys a “vacation” from the day-to-day routines. I try to treat her once in a while. One of our favorite things about Lake Charles is the walkability of the historic districts, downtown area and the local parks to explore - including 3 dog parks. Sam Houston Jones State Park is an outdoor dream for dogs that can handle a trail. For the more pampered pooches, several dining spots allow dogs to join their humans for a lunch/dinner date. 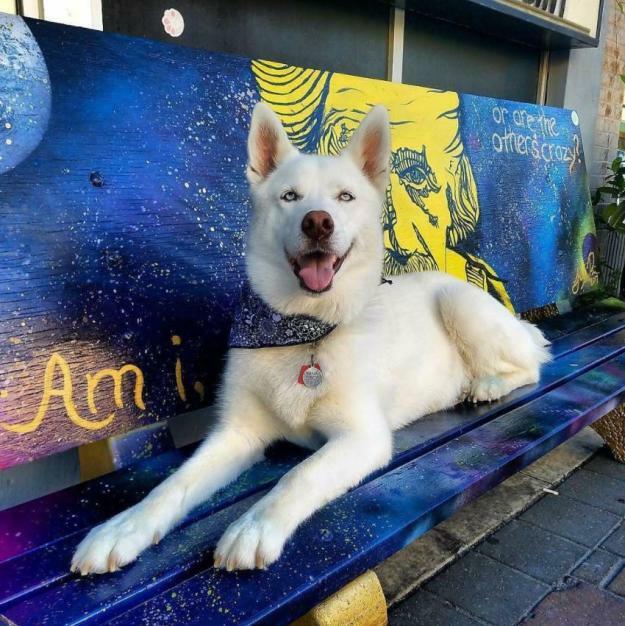 When I came across Luke Eddleman’s photo of his Siberian Husky, Ghost, chilling downtown at Luna Live, I couldn’t help but see a pup having a good time! And look how photogenic she is. You can follow Ghost&apos;s adventures in Dogs of Louisiana - The Jambalaya News column. We’ve got a whole page of pet-friendly locations in Lake Charles, not to mention our own Dog with a Blog “writer” Cooper the Goldendoodle. Read his blogs, here.